This Tsitsikamma hotel on the beautiful Garden Route is a must for visitors to Storms River Gorge. It is also the home of the Elvis Festival. 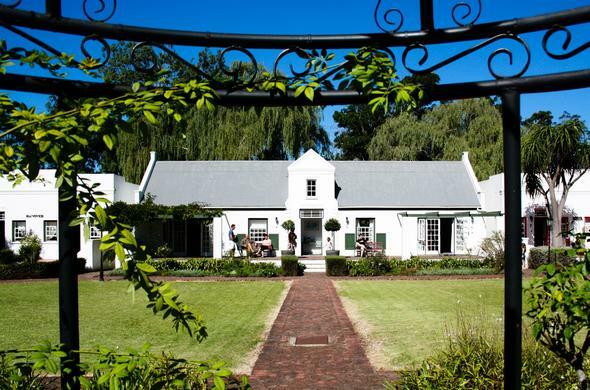 With park-like grounds, this Garden Route hotel has a Victorian atmosphere and design. Varied colonial room styles, hotel tea garden, pub and restaurant form a unique village. Travellers have been stopping in this beautiful area for more than a century to rest and admire the scenery. There are 49 elegant rooms at this Tsitsikamma hotel, and guests can choose their accommodation from a variety of colonial buildings which have been recreated in a village setting. The Tsitsikamma Village Inn is designed for comfort and charm. Visitors can relax in a wonderfully peaceful setting, sampling the great home cooking and treats at Cafe Bacchus. This delightful Victorian tea garden has a tinkling fountain and nearby is bright blue pool for refreshing swims and fun in the sun. The main hotel building in this village on the Garden Route contains De Oude Martha Restaurant for traditional Cape country meals, and also the Hunters Inn Pub, with its antique fireplace and comfy lounge. The hotel's Tsitsikamma Conference Centre is fully equipped and has an adjoining function room with a traditional yellowwood bar counter. Up to 84 delegates can be seated in the light and bright conference room and enjoy the peaceful surroundings. Exciting team building activities can be arranged through an on-site adventure company. Storms River Gorge is an awe inspiring place, a great abyss that cuts down to the sea, and all around is the Tsitsikamma Forest. Guests here can undertake a number of activities such as treetop canopy tours, bungee jumps, hikes and walks, boat trips and diving.